Sorry! Been real busy lately and thus the lack of updates. Been doing lots of bridal nails, and of cos some festive sets and lastly my regular customers. For now, 3 sets of nail pics! This is a set of bridal nails I did. Bride saw some of the frilly nails I did and said she'd love to have that and ribbons on her nails. And there, this design is created. This is done on acrylic extension. Lovely frills with pink AB and clear crystals. Pink AB crystals are so sweet and sparkly in real life. This is done on one of my regular customer. Initially she chose one of the design from Nail Max, then saw another, then combined all she likes into a set of nails. Pink, glittery, hearts, roses and ribbons. All in one set! :) This is done in acrylic as well. Her thumbs. Overloaded. But we love it! Love the pink stripey hearts! Ok, a set of sweet and simple gel extension. Light pink glitter tips, round pink disco ball (remember the Disco Ball nails I did?) flakes, and some holo flakes embedded. Actually, the pink disco ball flakes look very glossy and pinkish at different angles. It's really bad that pics don't show. Will post more next week. Night night! 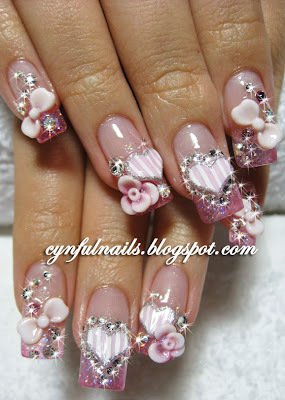 i really love your blog, awesome nails!